Encouraging others through the laughter and tears of motherhood. 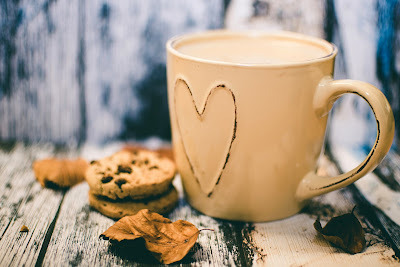 With this month being “the month of love” I wanted to share ways on how we love others in our home. Love is both a noun and a verb. Today I will be talking more about the verb side of love as in how we can cherish those the Lord has allowed in our lives and help them thrive. I will be relating this post to children today but the tips below can be helpful in any relationship. When I think of the children the Lord has blessed me with, I see how vastly different they are from one another. They look different, act different, learn differently from one another, and their love languages are different . 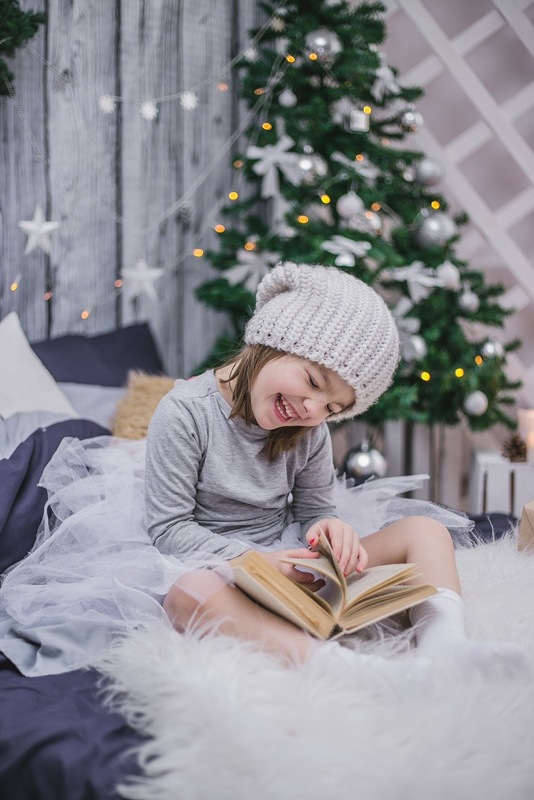 It takes time studying them, making mistakes, and as they become older, being able to talk with them about what they enjoy and how best to enter their world. Please join me over at My Pink Gems where I will share my top 5 tips of showing love to my tribe. Click here to read the rest of today's post. "How do you do it all?" "I don't do it all. I have routines in place and I do the best I can with what I have available to me (time, energy, and resources) for that day. My goal is to make things good enough, not perfect." 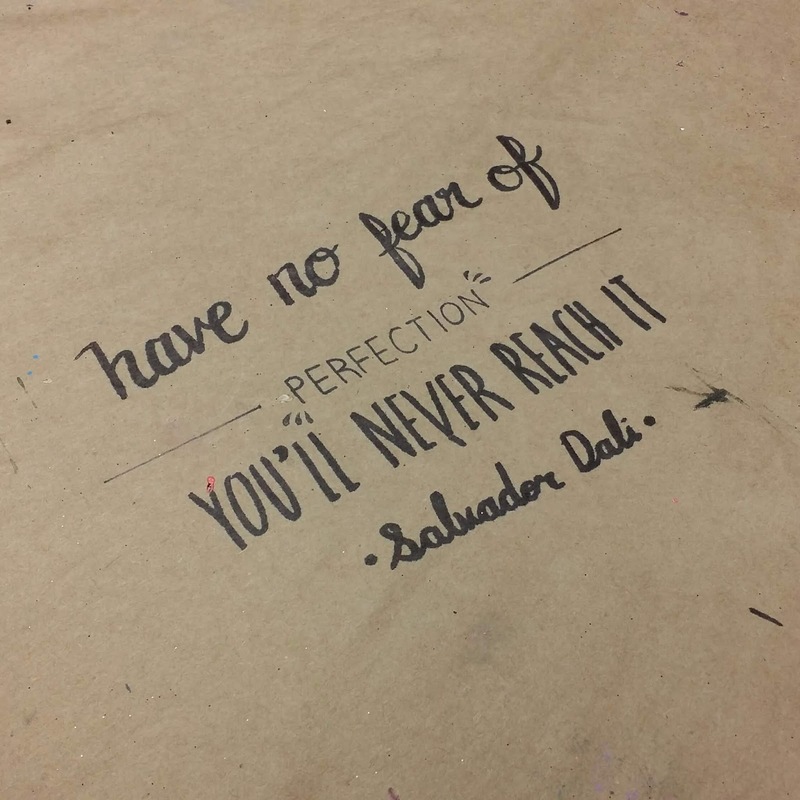 It has taken me years to let go of the perfectionist side of me but it was honestly too much to bear. I am not saying that I don't do a good job. 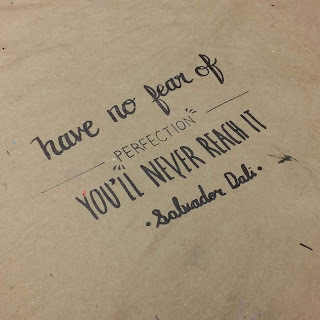 I put my heart into what is before me and I want to make it the best I can but I no longer keep aiming for things to be perfect because that is impossible and leads to unnecessary stress. In our home we don't follow the clock as much as we follow the routine. I have found in our family that when I have tried to stick to a schedule, I have been disappointed and frustrated. With six children it is impossible for me to say "At 9 am we will do such and such" because reality is that at 9 am my three year old might be streaking through the house naked while my 5 year old is attempting to clean up the third glass of water he has spilled this morning. My eight year old is trying to brush the mangled up knot out of her hair and needs my assistance, my ten year old has attempted a stunt on his bike (while he was doing chores outside) and needs me to dress his wound, and my teenage son forgot about an important physics meeting he had that he must rush off to. This is reality and my reality does not allow me to be hyper scheduled. Hence, the routine. Routines help us have a rhythm to follow in our home. 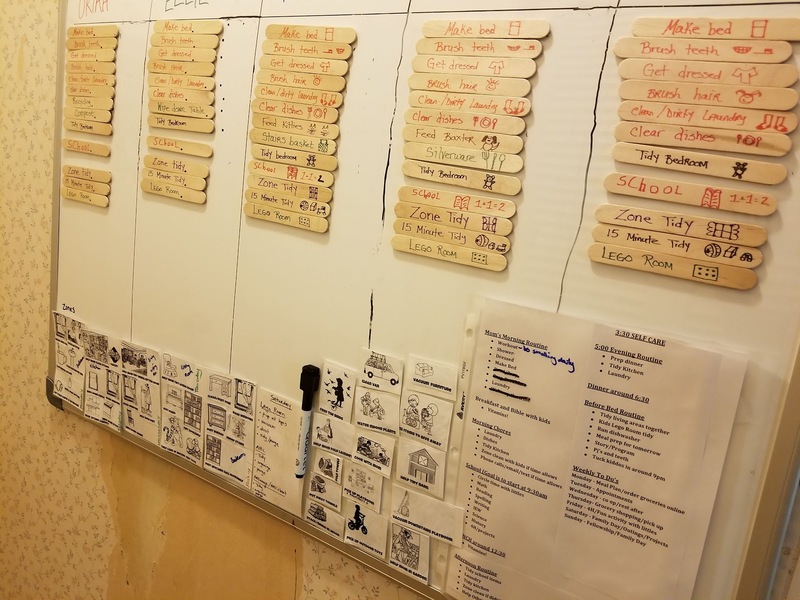 They keep us focused on the goals for that day and assist in keeping chaos at a minimum. Children especially need to have an order to things, a flow that is relatively reliable. It is easier for them if they know what to expect. To read more about our daily routine, click here to head on over to My Pink Gems where I talk about what we do to help our home run smoothly. Chore time is important in our household. We are a large family and in order to keep our home tidy, we all need to work together as a team to keep things afloat. To accomplish this we divide our day into chunks. We have daily routines that help us keep rhythm and order not just in our home but also in our day to day lives. Our routines help us to stay on course and not become overwhelmed. Above is a picture of our large magnetic board divided into 5 sections. One for each child. (Our 17 year old does not have a section as he knows his chores and has his own routines set at this stage in his life.) 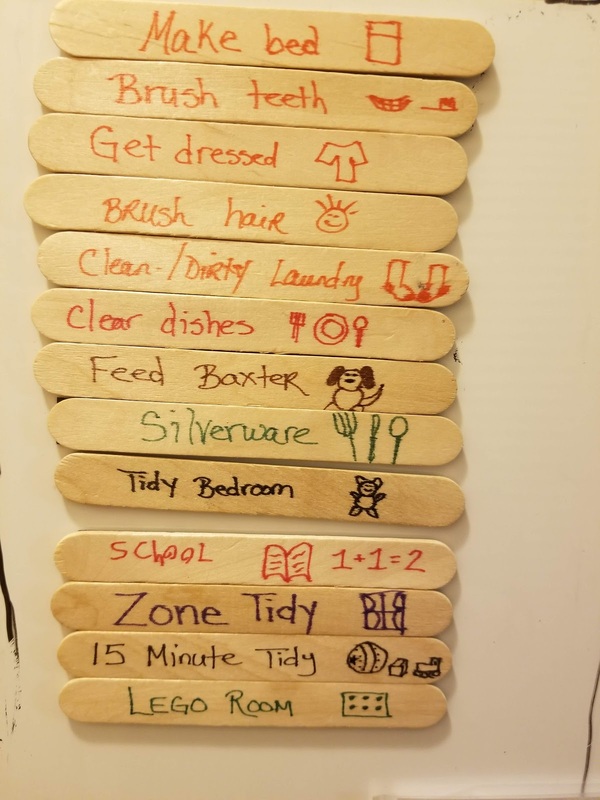 Each craft stick has a task written on it with a magnet on the back. The children all have the same basic chores (make bed, brush teeth, get dressed, take care of laundry, etc.) 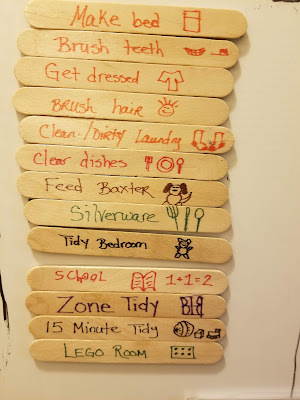 Then each child has a chore or two that is specific to their age level and we have a few daily tasks on their list as a reminder. 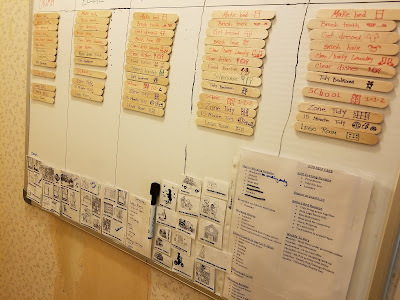 The large white sheet in the sleeve at the bottom of the board on the right is my routine. I like to have my routines visible in case I am having a brain fog kind of a day and cannot remember what the next step is. Here is an example of our five year old's tasks for the day. 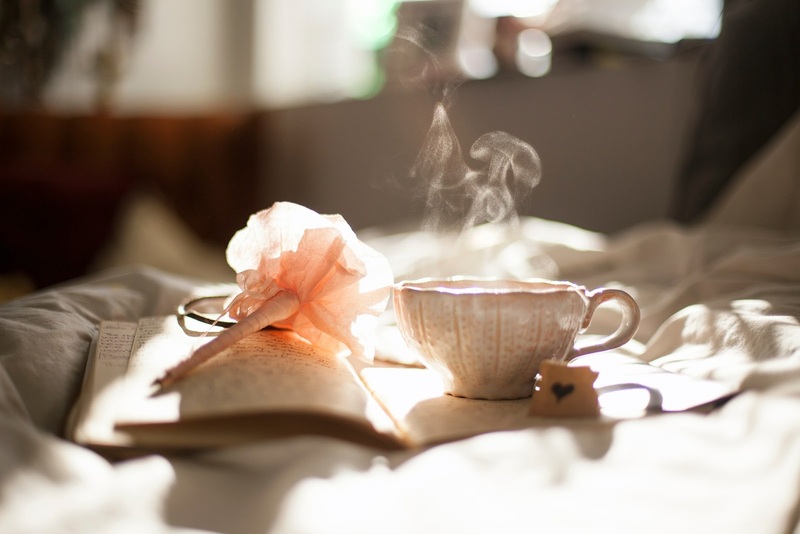 Everyone has the same basic morning tasks as well as their special responsibilities. He cannot read yet so I drew some simple pictures. On the marker board along the bottom are our "zone cards". We bless our house by focusing on specific rooms during the week. The cards help remind us which zone we need to focus on that day. You can read more about how we bless each area of our home by reading this post. 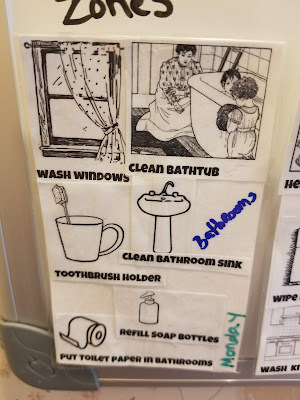 If I find that I need help with one of the above listed chores I just post it on the board for all the kids to see and they know there's a little extra task for the day. When the children have completed their chores they ask an older sibling to "check off" on them. Which means, the older child checks the list and if that chore is completed they put their initials next to it. If it is not completed they put a ? which tells me that I need to check in with that child to see why they were not able to complete their task or if they simply forgot, in which case, they can go finish it. This system provides accountability and builds teamwork. It has worked very well for this season of our lives. If the tribe wants to do screen time (devices/a program) they know that their tasks must be initialed. Screen time is not a given, it is a privilege that comes with responsibility. So, this helps keep everyone focused. If they ask to do a screen I just say "Well, let's go look at our board." It keeps life simple. A calm settles over me as Christmas draws near. My heart is at rest. 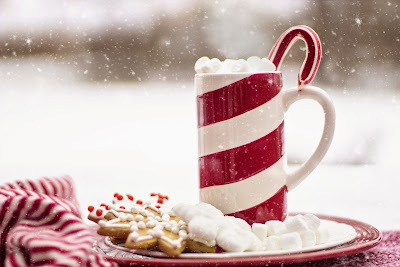 I love this time of year and all that it encapsulates however in years past I have become overwhelmed with all the busyness I allowed to creep into our holiday season. I would try to do all the things and that ended with me worn out with not much to give. I really just wanted to slow it all down and soak it in this year. So, I cut back on activities, and just enjoyed the wonder of the season which has made all the difference. I wanted to "be" and not "do". Someone told me, "we are human BEings not human DOings." I love the truth of that message. 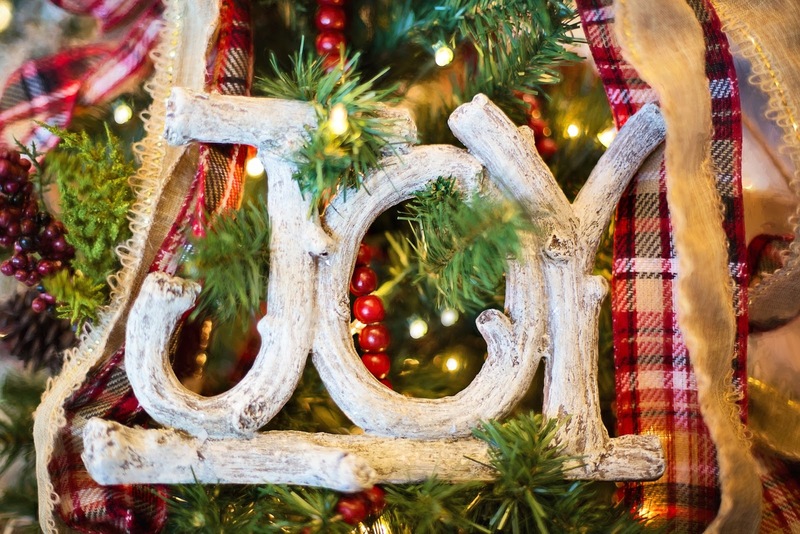 As we expectantly await Christmas morning I look back at the traditions I hold dear that help me "be" vs. "do". I am like a child at Christmas time. The excitement is palpable and I become giddy. I enjoy all of the planning that goes into such a special day. The children help me during the weeks and days before Christmas as we plan the menu, grocery shop, bake cookies, and wrap gifts. I make sure I do a little each day leading up to Christmas morning so I don't have to stay up super late Christmas Eve getting everything ready. I put my Christmas station on Pandora and I involve my children as much as possible. My rule of thumb is if we get tired or stressed then we stop for the day. I want us to be able to enjoy these planning moments because they are just as much a part of our traditions as Christmas day itself. Christmas Eve we spend making gingerbread houses and talking about the big day. We bless our house with a cleaning so Christmas morning everything is tidy and in order. As evening draws near we dress up and go out to sing carols and hear the Christmas message at church. Afterwards we pick up take out (Thai or Chinese food) and head home to set the table and have everything ready for Daddy's arrival from work. We eat our fun meal together and enjoy the Christmas tree. Depending on the time we may even watch A Charlie Brown Christmas if we haven't yet done so... it is the movie we end our Christmas movie extravaganza with. We tuck squirmy, excited children into bed and then my husband and I bring the gifts downstairs and place them under the tree before we head off to bed, although I won't sleep much. I am the first one up Christmas morning and, still donning my pajamas and slippers, I will sneak down the stairs and place a piece of candy in each stocking. I plug in the Christmas lights, light the candles, turn on the Christmas music, and set the coffee to brewing. I breathe deeply... it is Christmas morning. I pray and ponder what this day means and thank God for His precious gift to me, His gift of grace and salvation, and the sweet souls He has blessed my life with who still lay slumbering in their beds. I sing along with Away in a Manger as I preheat the oven and pull out the breakfast I prepped the day before. Everything is ready to go. I wander back up the stairs and kiss my husband good morning. We giggle as we gather six stockings and wake the children. "It is Christmas morning my darlings, everyone gather in Mom and Dad's room and we will begin our special day". My husband opens with a prayer and then we hand out the stockings, each holding a single piece of candy to be enjoyed. As they find their sugary treasure I read them a poem that thanks God for the gift of them, tells of why we celebrate today, and then reveals a riddle that they must solve. The morning scavenger hunt has begun. A tradition that began over a decade ago and that is one of the most looked forward to moments of our Christmas day. 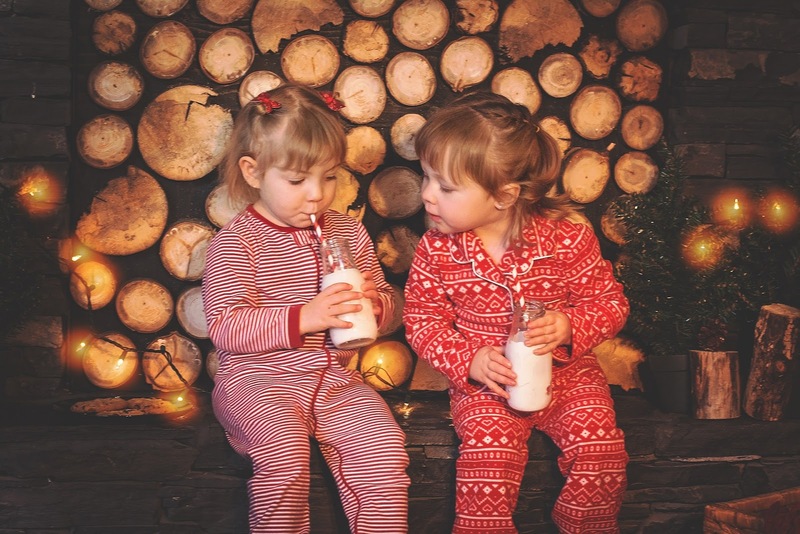 The children wander all about the house gathering clues until, at the end, they each receive a gift, rather than a stocking filled with small items. It helps simplify things and keeps overwhelm at bay. After our scavenger hunt is over we assemble at the table for breakfast. I keep food on Christmas day very simple (click here for this year's menu). Most of which I prep ahead of time because I do not want to cook on Christmas, that's my gift to myself. I also do not wash dishes. 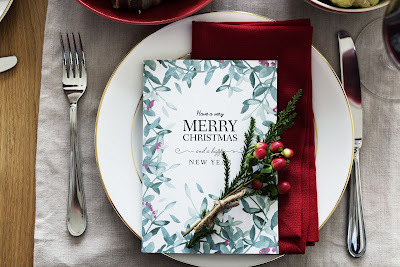 So rather than eating off of china, I find the cutest themed disposable dinnerware and set a festive table with table cloth, centerpiece, and plates. At the end of the day it all gets rolled up and thrown in the trash... no dishes, no hassle. After we are finished enjoying our meal, we gather around the tree and pass out gifts. Each person waits and watches as the gifts are handed out. We pass one gift at a time and watch that person open and enjoy their item before moving on to the next. It is very unrushed and leisurely. It teaches patience and the receiver of the gift is able to express their thanks to the giver. We keep gift giving simple, as I mentioned above. We find it works well for our family not just financially but also just the mind set of having a few nice things rather than being inundated with a bunch of items. After the gifts have been opened, we work together to tidy up and then we go about enjoying one another. We often receive a game for Christmas so we will set up and play the game together. My parents stop by to visit and enjoy food and laughter. It is a very relaxed and enjoyable day that ends with smiles and thankfulness all around. Don't be afraid, dear ones, to keep it simple on yourselves. No one expects you to be Wonder Woman, so you shouldn't expect it of yourself. If you notice yourself getting stressed, just stop. Take a deep breath and remember why you are doing what you are doing. Ask yourself if it is essential or if it can slide. Allow yourself to take shortcuts and keep things easy so you can enjoy what matters most this holiday season. I do not want to spend hours in the kitchen on Christmas day. So, I prep as much as possible ahead of time and keep the menu simple, that's my gift to myself. Ham in the crockpot (I use a lot less sugar than the recipe calls for and it still tastes great). Homemade bread (per request of my darlin' eight year old.) I will just make one loaf and pop the ingredients in my bread machine Christmas morning. I just buy frozen gf rolls for myself if I want bread. 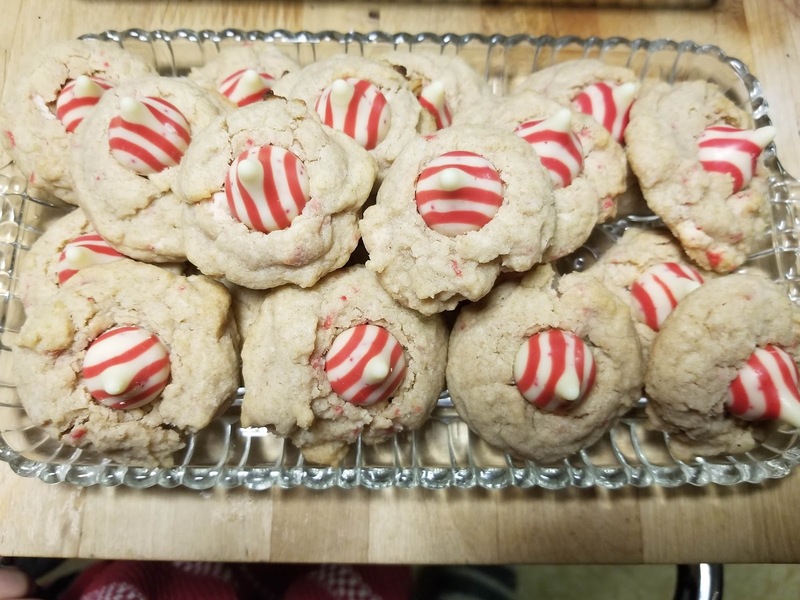 Goodies include Peppermint filled whoopie pies (click here for gf version), pretzel turtles (you can make these with gf pretzels too), and muddy buddies with cocoa and candy canes. Christmas is my favorite time of year. The music, the baking, the wrapping, the giving, the decorating... oh my goodness, do I LOVE IT! However, even in the midst of my precious ones singing "Grandma Got Run Over By a Reindeer" and seeing their joy as they choose and wrap gifts (with lots and lots of tape) for their loved ones, life still happens. I just want to share with you a little bit of reality in case the past few Countdown to Christmas posts seem like too much silver and gold. My children attend a co op once a week and I help teach a few classes. My first class of the day happens to only have two preschool students, who also happen to be my kids. I read stories to them, sing songs and do crafts for 45 minutes. It's fun! Or so I thought, until my four year old confessed that my class was boring. So, the following week I tried to make our time together more exciting. I decided to hide stuffed animals around the room and have the children go find them. Giggling ensued as my 3 and 4 year old raced about trying to find all the hidden Beanie Babies. I'd tell them if they were getting "hot" or "cold" depending how close they were to the stuffed animal. My four year old was "getting warmer" and becoming very excited to find an animal when his little sister shrieked out "I found one! I found one Momma! I found a STUFFY!" 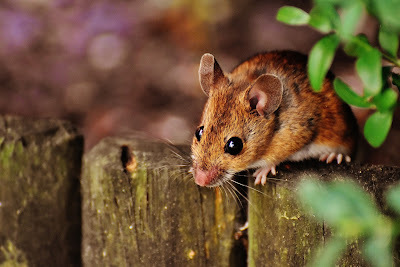 I turned around to see my precious blond haired darling with a dead mouse in her hands. The critter was lodged in a trap but his body was protruding from it. Her dimpled hands were squeezing it's lifeless body as if it were an orange and she was determining if it was ripe or not. Once she realized just how squishy her "stuffy" was, she dropped it like a hot potato. I scooped her up and whisked her off to the bathroom where we washed our hands for quite a while. 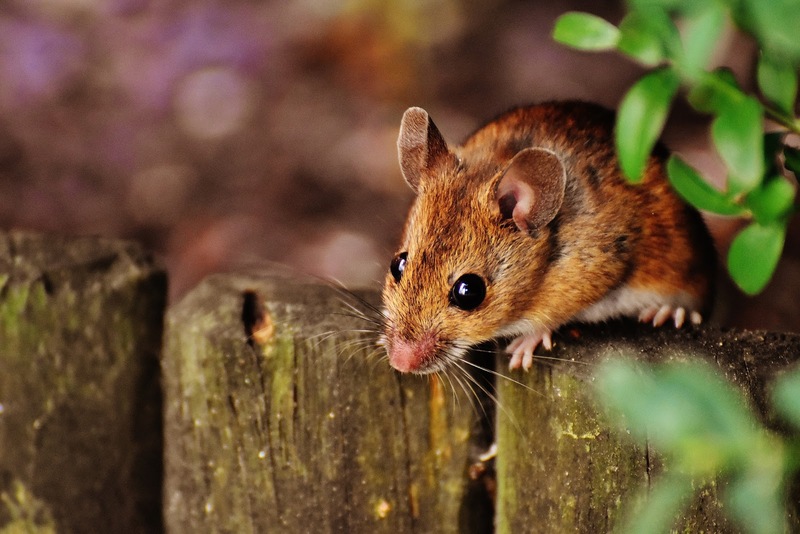 Once we got back into the classroom I disposed of the mouse. This is life. Head on over to My Pink Gems where I am guest posting today to read the rest of my Countdown to Christmas reality! The Christmas tree is glowing warmly with it's colorful lights and the scent of pine fills the air. Cozy blankets are draped over the couches awaiting little ones to curl up in them as night falls and the wind beckons to come inside. These are the days where we don sweaters, wear comfy socks, and have soup for suppah'. While the soup simmers and the tea kettle sings I gather my sweet ones about me and let them help gather ingredients. Dimpled hands plunk butter and flour onto the counter. 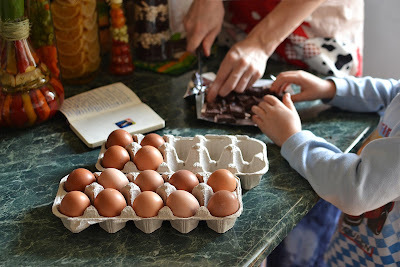 Older children grab the eggs and my eager six year old fetches his favorite ingredient... SUGAR! It is cookie baking weather and while Bing croons in the background, we whip up our holiday favorites to hand out to friends and family and hold back enough to enjoy ourselves. So grab your favorite cuppa and join us for our favorite recipes of the season. Preheat oven to 400 degrees. In a large bowl cream the butter and sugar with an electric mixer. Beat in the egg and the vanilla. Add baking powder and flour, one cup at a time, mixing after each addition. Dough will be stiff; blend last bit off flour in by hand. No need to chill dough. Divide dough into 2 balls. On a floured surface roll each ball into a circle, 12 inches in diameter and about 1/8" thick. Cut and bake 6 to 7 minute for cut cookies and 8 to 10 minutes for drop cookies, or until edges are lightly browned. Cool and frost if desired. Add 1 tsp peppermint extract in addition to the vanilla extract. Use drop cookie method to scoop dough into 1 tsp round balls and bake for 8 to 10 minutes or till edges are lightly browned. Let cookies cool for a few minutes. While cookies are still slightly warm, press a whole Hershey Kiss into the center of the cookie and pop them into the freezer for about 15 minutes so the Kiss doesn't melt. Enjoy! These cookies smell like snow to me. 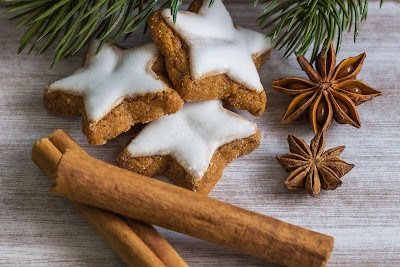 When the winter weather kicks in you can be assured that I will break out the molasses and ginger and bake a batch of these beautiful classic cookies that remind me of Grammy's house. The only substitute I make to the recipe is that I use butter instead of margarine because I prefer the taste and texture it gives to my baked goods. A very easy but addicting treat made from 3 simple ingredients; rolos, pretzels, and M&Ms. My little ones LOVE to help make these. When we run out of Rolos we use the extra Candy Cane Kisses and make pretty red and white striped pretzel turtles. ;) The recipe is easily adaptable. You can use a pecan to top each turtle instead of an M&M, or you could use different mini candybars (Milkyway, Snickers, Almond Joy) instead of Rolos. Enjoy! King Arthur not only has a good gluten free flour blend, but they really mastered this recipe. It is hard to tell that this is a gluten free cookie. If you or someone you know has a gluten intolerance, give these a try. You'll be reaching for seconds in no time. These are my ultimate favorite chocolate chip cookies, hands down. I love Ghirardelli's 60% cacoa chocolate premium baking chips. They are a nice, big chocolate morsel made from premium cacoa for a rich taste. Grab a big ol' glass of milk to chase these down with and don't forget the napkin because these are awesome warm out of the oven. 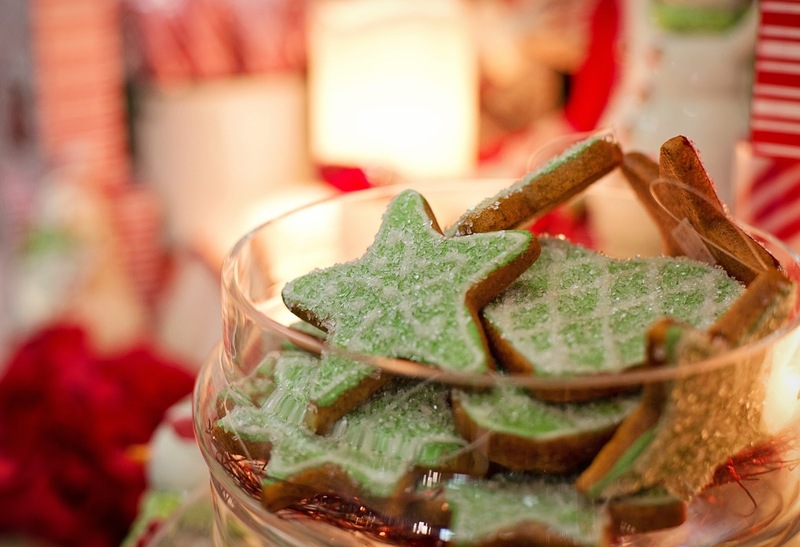 What are your favorite cookies to bake or enjoy this time of year? Please share with me in the comments below. Thank you for joining me for another Countdown to Christmas Saturday. May your days be Merry and Bright and your cookie jar be plentiful!